It was sure nice to laze around a bit today. I got up in time to watch a bit of the Rose Parade, a yearly tradition for me — if I’m not at work. I always marvel at the green leaf-covered trees in Pasadena while I stare out at our frost covered deck. As previously stated, I’ve always enjoyed the Tournament of Roses Parade… ever since I was very young. It was such a novelty for a kid, living in the cold northwest where very often the ground was snow covered, to see the orange and palm trees sway…. as the song says. 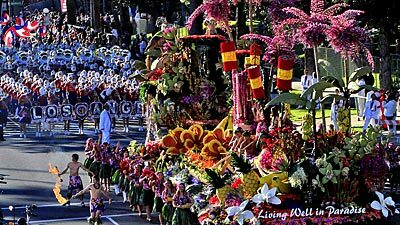 So, when we actually moved to southern California a few years back, I jumped at the chance to go see the famed parade in person. My dear husband was “game” to go with me, so we purchased tickets from a company that provided the transportation, snacks for the drive, and of course seats at the parade. Since the festivities start bright and early at 8am and the drive was about 2 hours, we were in bed long before midnight on New Year’s Eve and up at an insane hour on New Years Day, 2002. But “Oh”, I thought, “it will be worth it”. All I can say is, for the most part it was a huge disappointment. The seats were so-so, the food was blah, but the worst was the setting of the parade itself. After watching on television for so many years, I had a picture in my mind of how it would all appear in “real life”. Colorful, and beautiful, with appreciative spectators all around. What a let down it was when I realized that the super clean scenes from TV were just that. Areas outside of the camera’s eye were horribly littered with papers and who-knows-what all. My childhood vision was shattered. Still, we did our best to enjoy the yearly event, despite the overflowing portapotties and debris fluttering all over the place. It was something I’d always wanted to do and I did it. Check another one off the “bucket list”, dear. These days I’m perfectly happy to watch in the comfort of my own home and enjoy the gorgeous floats from the pristine eye of the TV camera. Later today we worked rather hard at getting Christmas decorations put away. One of these years I’m going to boycott all the decor. I don’t mind the putting up, but the taking down is just no fun. Until it’s done. Then I breathe a sigh of relief that all the clutter (which was “beautiful” just two weeks earlier) is gone. Whew. Boxed up and put away for another year. After the UN-decorating, I got back to the business of lazing around. 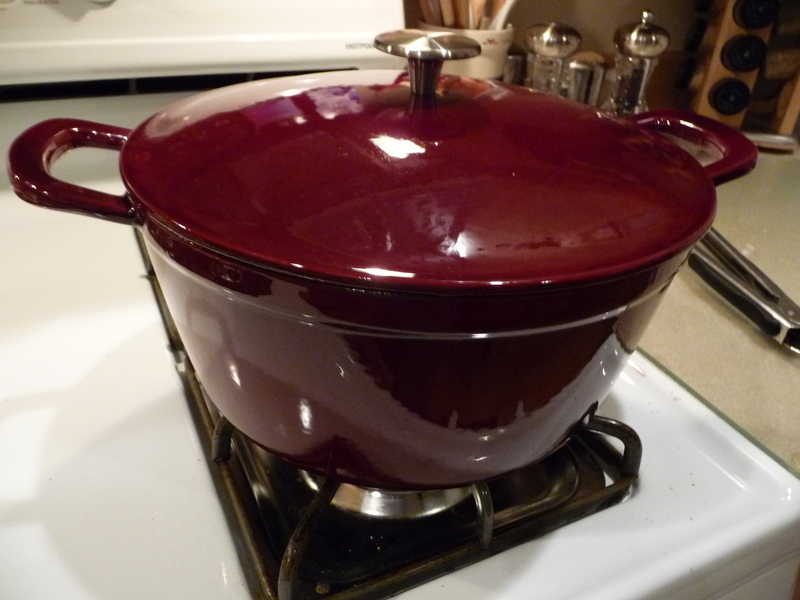 While I relaxed, dinner cooked itself in my new enamel coated cast iron Dutch Oven. Yum. 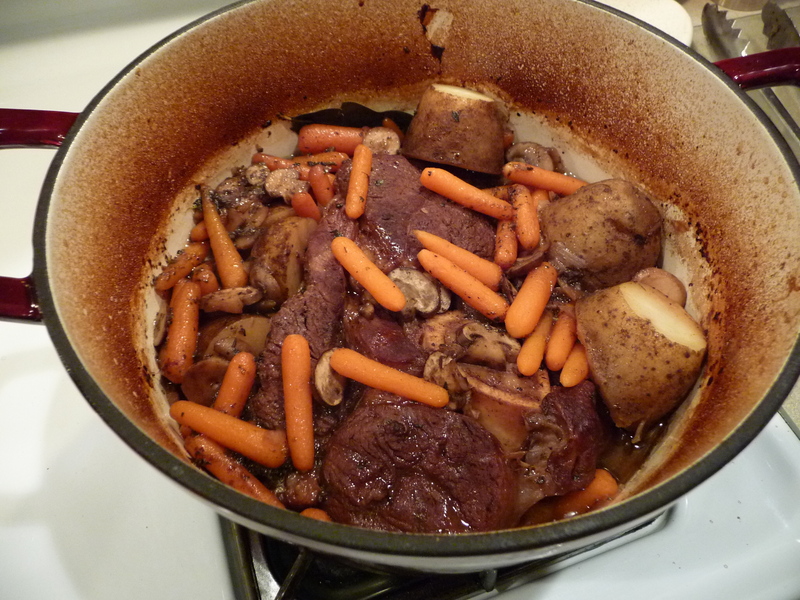 This entry was posted in General Musings and tagged dutch oven, pot roast, Rose Parade. Bookmark the permalink.